Mono series for novice in 1998. There are currently no setups for VAZ 21083 LadaCup. Add a Setup. 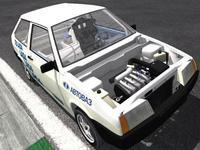 There are currently no car skins available for VAZ 21083 LadaCup. If you are a painter you can share skins for this mod via the Car Skins area. Visit the Spray Booth for painting tips & tricks. 1.1 not working on latest release of RF2. Thank you for this new car for rFactor2 car. Just a question : should I downloaded all 3 files below? VAZ 21083 LadaCup 1.10 Seem to be the same file, no ? Download LadaCup98 V1.2 Is it the last release V1.10 to V1.2 ? So I can watch the car drive but can't drive it myself due to this problem.